In one of our very first posts, Shannan and I asked you for your favorite all-natural cleaning products. We got such a great response from that post and since then I've slowly but surely tried out a few of your suggestions. I'm particularly fond of a couple of very simple, make at home recipes. I can't believe how inexpensive these are and well, they actually work! I will share a couple with you today. In a spray bottle, mix 1/2 distilled white vinegar and 1/2 distilled water with 1/4 to 1/2 teaspoon all-natural liquid soap. Add 15-20 drops lavender essential oil and/or 5-10 drops of tea tree oil. We talked about tea tree oil's antiseptic properties in a recent post, but lavender oil can also be antiseptic. I also just love the relaxing scent of lavender. When I first tried this surface/window cleaner, I was a little skeptical that it could actually clean streak free. It does! The other thing I noticed...my nose didn't get all stuffed up during cleaning like it used to. Effective and safe! Why vinegar? Vinegar is completely safe for humans. We can get it on our skin, ingest it, cook with it, and etc. Because of it's level of acidity vinegar kills most mold, bacteria and germs. In a bucket of warm water, add 1/4 cup of all-natural soap, 1/2 cup baking soda, 15-20 drops of lavendar oil, and 15-20 drops of tea tree oil. Mix well in the water and this should tackle tougher jobs like floors or walls. 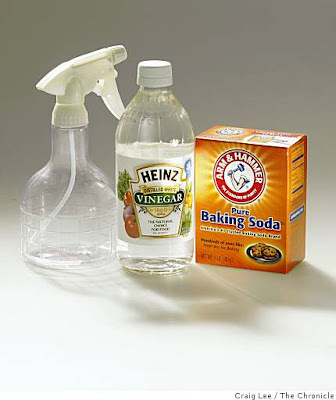 Baking soda causes dirt and grease to dissolve in water. I just love the simplicity and safety of these cleaners. With just a few basic ingredients you keep on hand, you can clean pretty much everything in your home. No worries about your kids or pets getting into products. These are really so inexpensive as well - you can't beat the price. The other day while doing some spring cleaning my 3-year-old came into the room and asked me "what smells so good mommy?" It was the Heavy Duty Cleaner I was cleaning with.